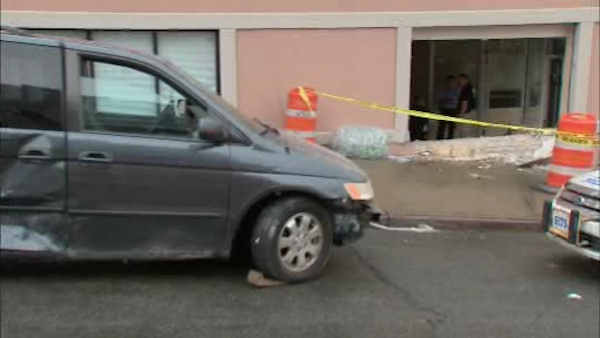 WOODSIDE (WABC) -- A minivan slammed into a therapy center in Queens Thursday morning, prompting the evacuation of a nearby daycare. The incident happened at 65th Place and Queens Boulevard in Woodside. Police say the van was trying to avoid hitting another car when it jumped the curb and hit the building. Four people in the car were hurt, but all of the injuries were minor. Windows were smashed at the therapy center, and as a precaution, the neighboring daycare center was evacuated. Worried parents rushed to get their kids.